Many of you are bored with the window explorer look which is good, but here we are talking about how to make it a little different. 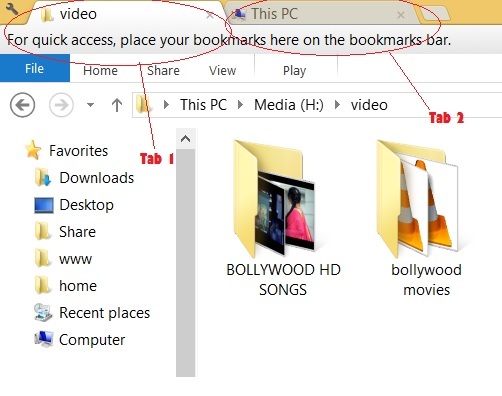 Like in the Chrome browser you open different tabs and view different sites, similarly in window you can view different folders and settings control panel in different tabs. This can be achieved by the simple software which just converts your normal explorer to the chrome style explorer. See the below images for better understanding. Like you have to copy some files then you can just open the two folders in different tabs and select the files and drag it to the others. There are many possibilities. Lets first see how it can be done than you will know about the advantages very easily. This can be done using a small, light weight and free software or rather say it an extension. The name of this software is Clover. 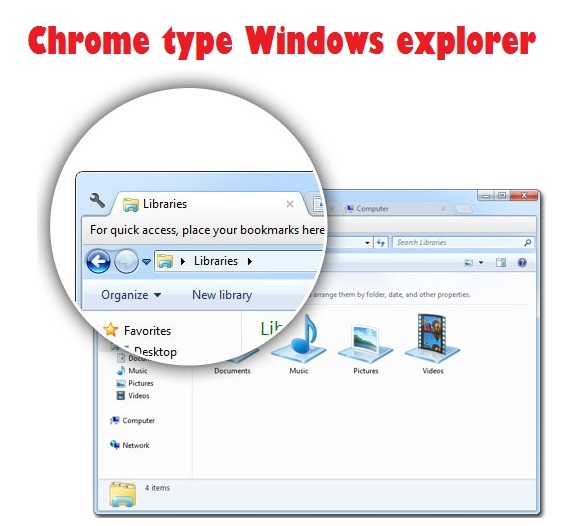 It is an extension of the Windows Explorer, to add multi-tab functionality similar to Google Chrome browser. After install Clover, you will be able to open multiple folders within the same window, and you can also add folder bookmarks. Remember some simple shortcuts like "Ctrl + T" to open the page, and "Ctrl + W" to close the page, "Ctrl + Tab" to switch pages, the work efficiency far more than doubled! Press "Ctrl + D" to bookmark the current path, or drag the folder into the bookmarks bar. No need to look for the folder around, instant reach! Clover currently only supports Windows XP and later versions of Windows (32bit/64bit), and support the most common languages ​​such as English and Chinese. Thank you for reading this post. Ask any question in comment section.